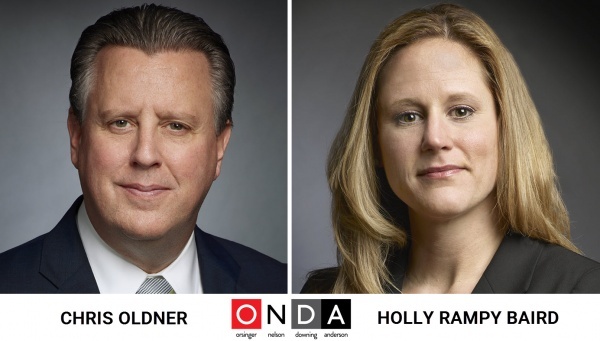 DALLAS – Boutique family law firm Orsinger, Nelson, Downing & Anderson, LLP, is pleased to announce the promotions of Chris Oldner and Holly Rampy Baird to partner. Mr. Oldner served three terms as judge of the 416th District Court in Collin County, where he presided over criminal and civil cases, including family law bench and jury trials. With the distinction of holding dual certification in Family Law and Criminal Law by the Texas Board of Legal Specialization, Mr. Oldner’s practice encompasses a wide range of domestic law cases. He has served as co-chair of the Judicial Disproportionality Workgroup for the Supreme Court of Texas Permanent Commission for Children, Youth and Families’ Court Improvement Project, and as a member of the Texas Center for the Judiciary’s Children’s Justice Act Task Force. Mr. Oldner earned his law degree from the Texas Tech University School of Law. Recognized for five consecutive years on the Texas Rising Stars list, Ms. Baird earned a place on the publication’s list of the Top 100 Up-and-Coming lawyers and the Top 50 Up-and-Coming Women lawyers. She also was recognized on D Magazine’s 2018 list of Best Lawyers Under 40 for her work in divorce and complex property division, modification and enforcement actions, and child custody litigation. Most recently, Ms. Baird was selected to People Newspapers’ 20 under 40 listing for 2018, which honors young professionals making the biggest impact in the Park Cities and Preston Hollow neighborhoods of Dallas. Certified in Family Law by the Texas Board of Legal Specialization, she is a graduate of Texas Tech University School of Law. Orsinger, Nelson, Downing & Anderson, LLP, is a nationally recognized firm with more Top 100 Super Lawyers in Texas than any other family law firm in the state. With offices in Dallas, Frisco and San Antonio, Orsinger, Nelson, Downing & Anderson, LLP, is one of the largest Family Law firms in the state. Each partner is Board Certified in Family Law by the Texas Board of Legal Specialization, as well as a member of the Texas Academy of Family Law Specialists.